If you are researching mortgage offers, here are some tools that, hopefully, can help you find the best rate available. 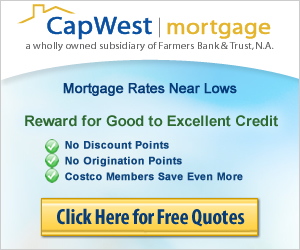 CapWest Mortgage is a wholly owned subsidiary of Farmers Bank & Trust, N.A. Farmers Bank & Trust is a family owned bank that has been federally chartered since 1907. CapWest Mortgage can originate home loans, using conventional, FHA, and VA loan products, in all 50 states and it has helped a diverse set of homeowners achieve their dream. In addition, CapWest Mortgage also provides the lowest rates and closing costs available with no miscellaneous, hidden expenses. Being a Fannie Mae direct lender, CapWest has the advantage of keeping rates low with no markups, passing the savings back to the borrower. CapWest Mortgage is also a Costo approved lender. If you are a member of Costco, whether at Goldstar level or Executive level, you can save even more with CapWest using your Costco membership. If you have good or excellent credit (find out your credit score now), you should check out CapWest Mortgage and get a free loan quote. Connect and begin to guide you through the process. Pull your credit and provide loan options. Send you a good faith estimate & then accept your deposit. Process and underwrite your loan. With Quicken Loans, you can get mortgage rates, closing costs, and loan suggestions all online in minutes. Quicken Loans closes loans in half the time of most other lenders. Get a free quote online or call 877-219-9361 to talk to a loan specialist at Quicken Loans to find out the latest rates.